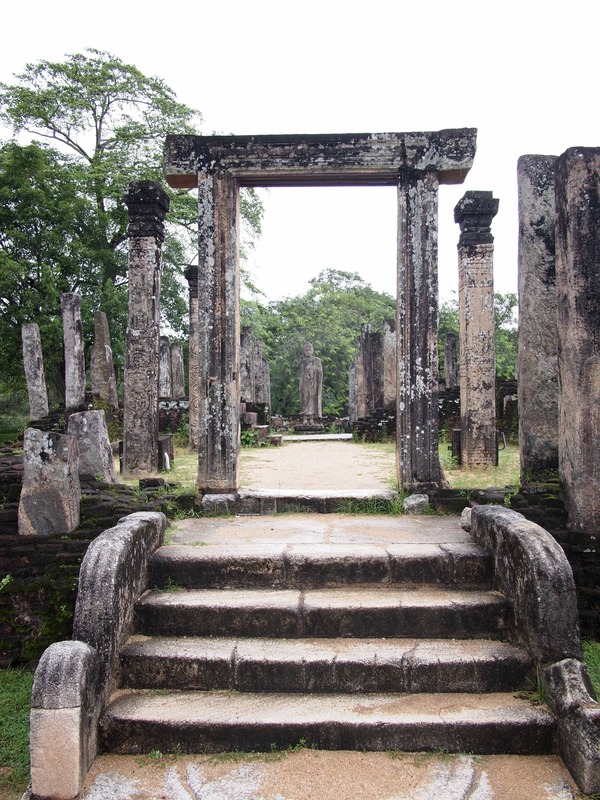 The Cultural Triangle is one of the most popular tourist trails in Sri Lanka. I am a bit of a temple junkie, having done so many throughout India over the past 18 months, so I couldn’t resist seeing the famous sites of Sri Lanka. What I didn’t realise was just how much Buddhist history was in this country. So much so that at times it felt overwhelming, whilst at others I simply felt a little “Buddha’d out”. 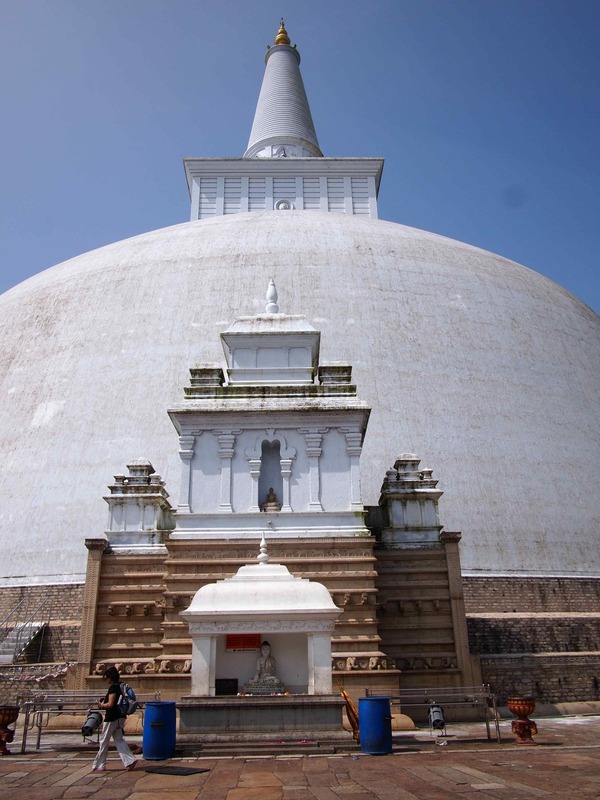 Our tour of the Cultural Triangle started in Dambulla, where we headed up the steep hill from the Golden Temple (not to be confused with the one in Amritsar) to the Royal Rock Temple, which is a series of five caves from the 1st century BC. The caves were magnificent and reminiscent of those I had seen at Ajanta. 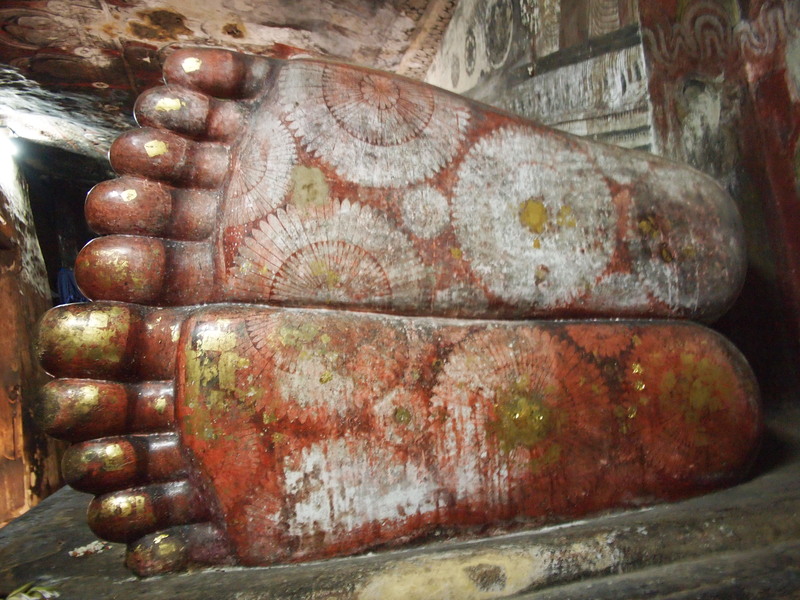 Some had huge reclining Buddhas, looking peaceful with magnificent paintings on the feet. The size of the caves was amazing, and all contained beautifully preserved carvings. It is a spectacular site to visit. 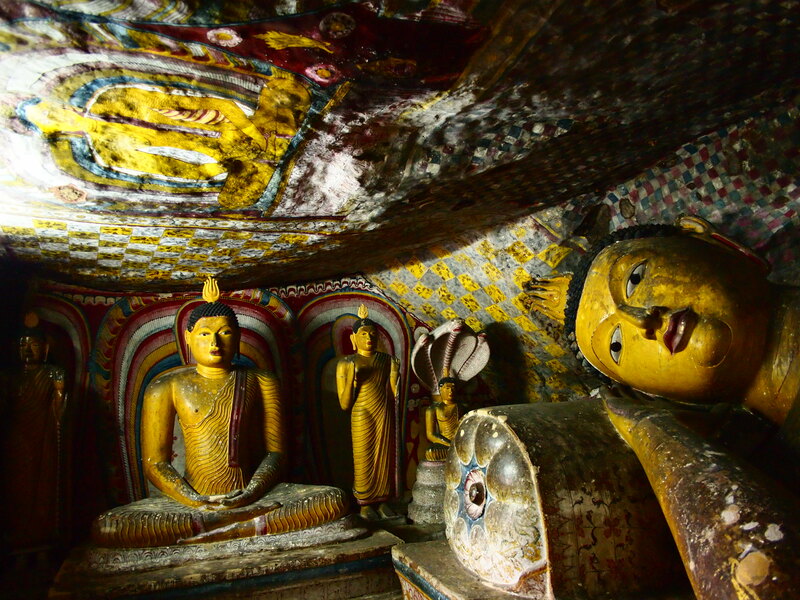 At about 60 metres high, the Buddha inside these walls is just magnificent. Similarly the sacred quadrangle (that once held the sacred tooth relic of Buddha) also had some specatcular structures. It never ceases to amaze me how these towns must have looked in their day. The craftsmanship must have been incredible, along with the attention to detail. 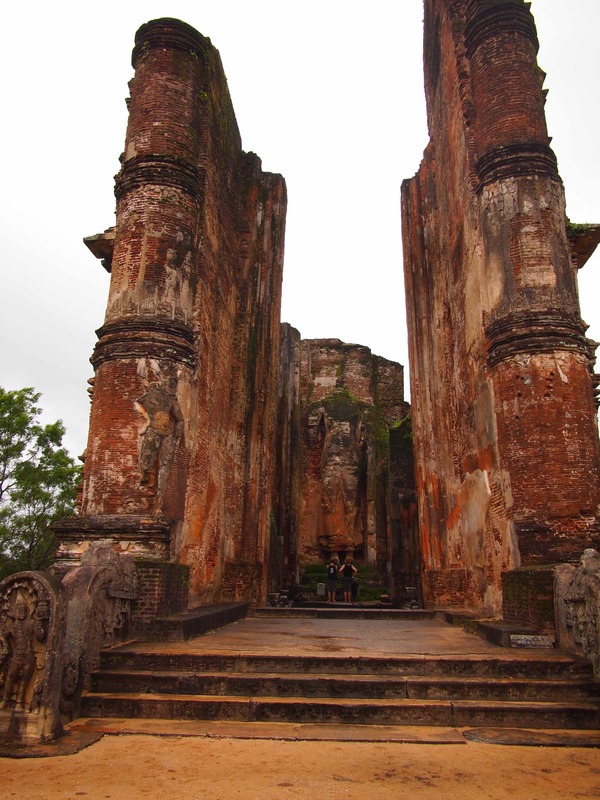 Whilst it was raining the day we visited Polonnaruwa, we were still able to explore the old city well, and it remains one of the highlights of my trip to Sri Lanka. 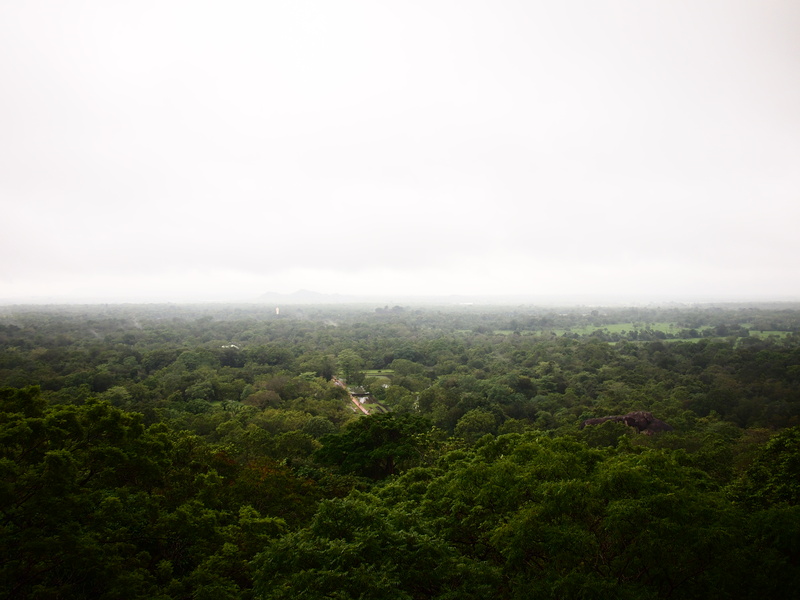 The next day we planned to climb Sigiriya before heading onto Anuradhapura. Unfortunately the elements were not on our side and it looked rather grey and dim when we arrived at the Lion Rock. We decided to persist and started heading up. By the time we were halfway, what was a slight drizzle had turned into torrential rain. Whilst the view was stunning, this experience was not fun! But most of all, it is famous for the huge carving of a lion that graced its summit. All that remains today are the lion’s paws, and whilst I did see them, it was just far too wet for me to take out my camera. The climb back down was nothing short of terrifying for me. I find coming down steep steps challenging in the best weather, but under slippery conditions it was an experience I never plan on repeating. 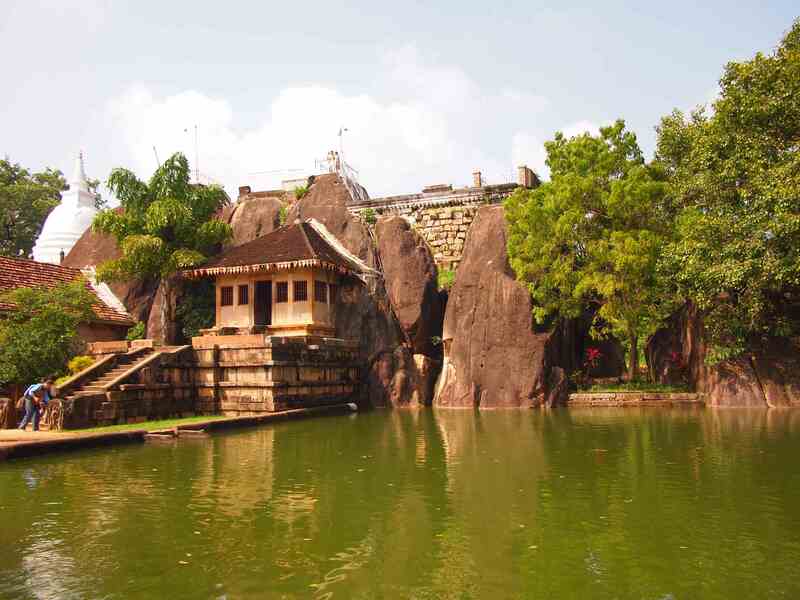 and this ancient rock temple. Look at the carvings of elephants in the rock. There were so many other towns that we didn’t visit in Sri Lanka that contain other pieces of its history. I am already planning when I can go back to see the rest of the Ancient Cities, hopefully soon. Beautiful temples I knew nothing about! Thanks for highlighting this beautiful place so close to India that we often overlook. My pleasure, I do recommend a visit to Sri Lanka. Nice to read a blog post about Sri Lanka. It still seems to be a ‘hidden’ jewel for those that focus on India and are blind-sided by this unique island. People just seem to ignore it; may be thinking that it is just another, smaller, part of India. So close to India and yet…not. I have not been back there since 1995 when I spent one month there (mainly based in Unawatuna near Galle, but with many 2-3 day trips north). I remember being financially caught out by my misconception that everything would be as cheap as in India (India was cheap in those days – but accommodation prices have now increased considerably since Indians have now taken to enjoying domestic tourism). It was more expensive. And justly so – the quality of life seemed to be higher…even with a war in the North of the island. How are the prices these days? I rememember that the food was rather same-same (if you wanted local food and not reinvented ‘Western’ food – not as varied as India’s and sometimes bland, but usually chili-centric. As a vegetarian I had no problems with it and it was a very, and interesting, welcome change from my ‘normal’ Western diet. Coconut ‘hoppers’ for breakfast anyone!? Brilliant tropical fruit as well. Mangosteens spring to mind! You should follow Mark Wien’s (not me!) blog at http://migrationology.com/ for info/videos about asian food. Last year he posted about his sojourn to Sri Lanka and travelled to Jaffna in search of great food. I believe that he is in India right now. Thanks for this post Rakhee! Take care. I’ve never been to India, so I can’t really compare the two countries. But I’d say Sri Lanka is also relatively cheap. However, to use this to your full advantage I think you need to know locals. When people see that you are a foreigner they assume you are rich and try to get more money from you. If you have a Sri Lankan friend, he can negotiate on your behalf. I remember when I was working in Colombo four years ago, I used to eat a really good fried rice from a local place. I cost me less that one dollar. I think if you are staying in Hotels it could be a bit expensive. But if you can manage to stay with locals, It would cost you next to nothing to travel in Sri Lanka. An amazing and informative post as usual! Thankyou.